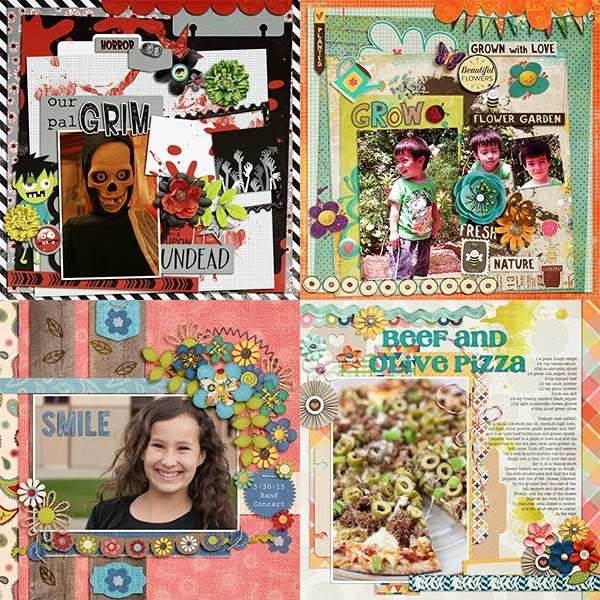 DSD 2014 ~ TEN new releases, FIVE FWP offers, and a FreeBee Template! 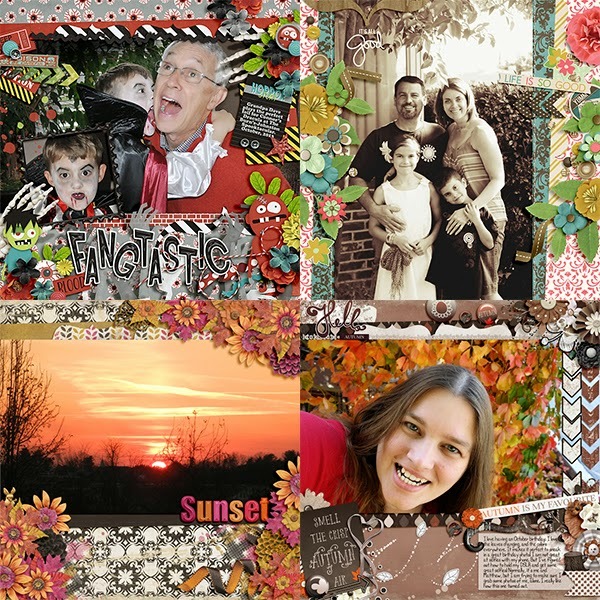 I absolutely love digital scrapbooking, and I'm so happy we have a day set aside to enjoy our passion! Well, it ends up being more like DAYS, but that's OK with me. The more scrapping the better! I have lots to share with you today, so let's get started! 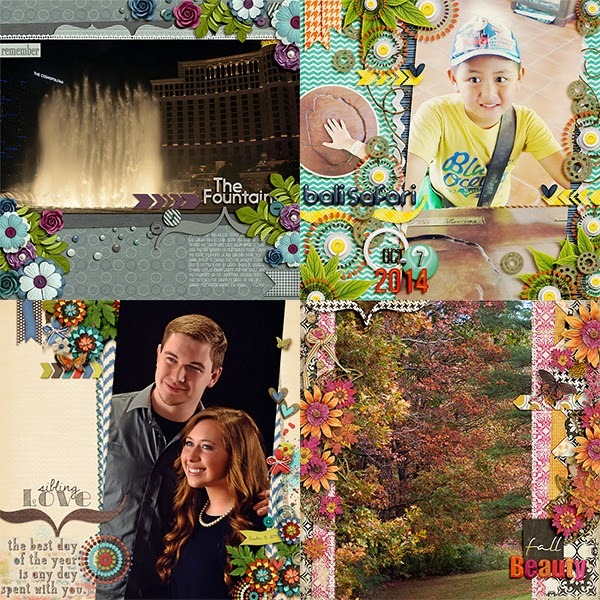 Our Digital Scrapbooking Day 2014 Storewide Sale starts today! 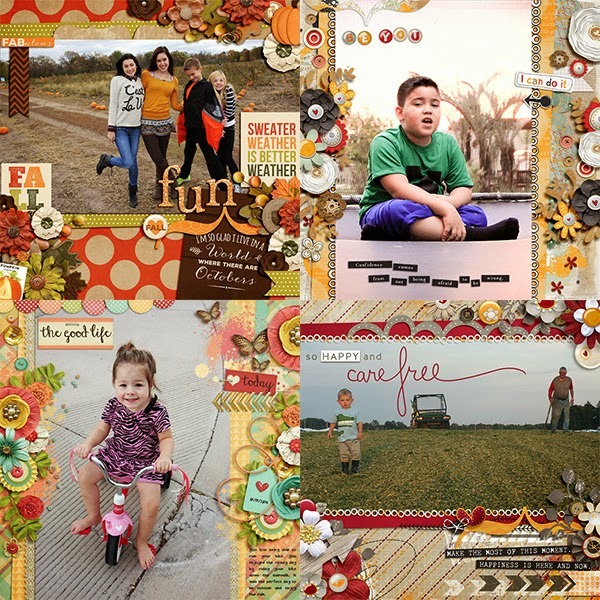 All my new releases as well as current Fiddle-Dee-Dee Designs template packs are on sale for 35% off! 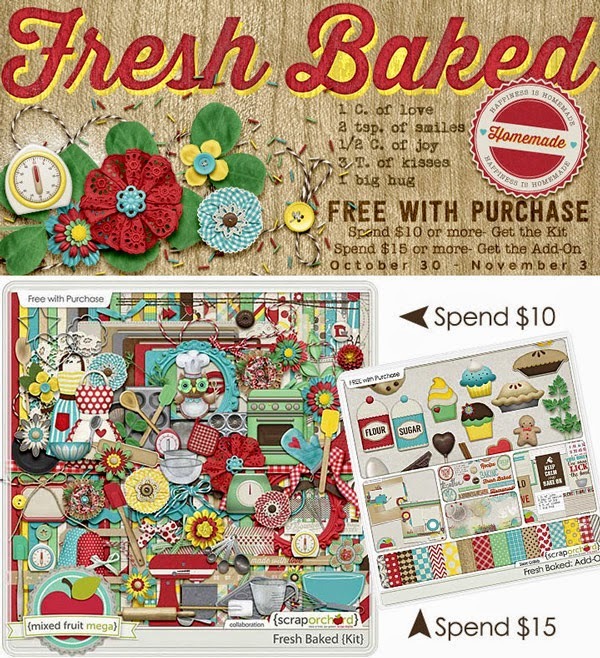 Spend $10 or more in the store and you'll automatically receive the Fresh Baked collaboration kit. Spend $15 or more and you'll receive the kit and the add-on! 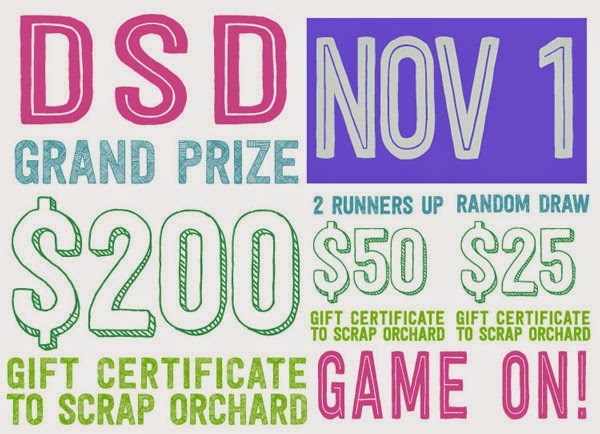 Make sure you head over to our DSD 2014 Game On Forum for all the details on the games, challenges, and more that we'll be hosting to celebrate! Make sure you fill out your Game On Score Card and upload it before November 1, 2014, at 9:00 pm Eastern. We are going to have so much fun playing virtual Yahtzee and having a nice chat at the end of the day on Saturday. You'll want to clear your schedule to ensure you don't miss anything! In addition to all my products being on sale, you'll also find these fantastic NEW items on sale as well! I'm so excited about these! 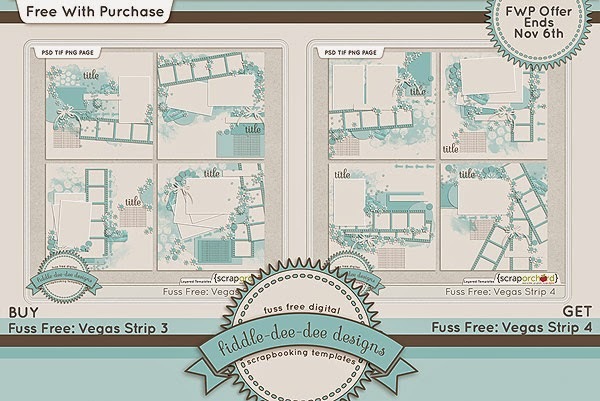 Just like the hotels and casinos that line and surround the Vegas Strip, the templates in Fuss Free: Vegas Strip 3 and Fuss Free: Vegas Strip 4 are built around one or more photo film strips, accompanied by larger picture spots as well as paper pieces and elements to create a fantastical layout design. From travel to Las Vegas and beyond, to simple photo booth shots from birthdays, weddings or other special events, Fuss Free: Vegas Strip 3 is the ideal template pack to help you create multi-photo layouts quickly and easily. I have to admit it. I'm mostly a single page scrapper, but I've recently starting creating double page layouts. 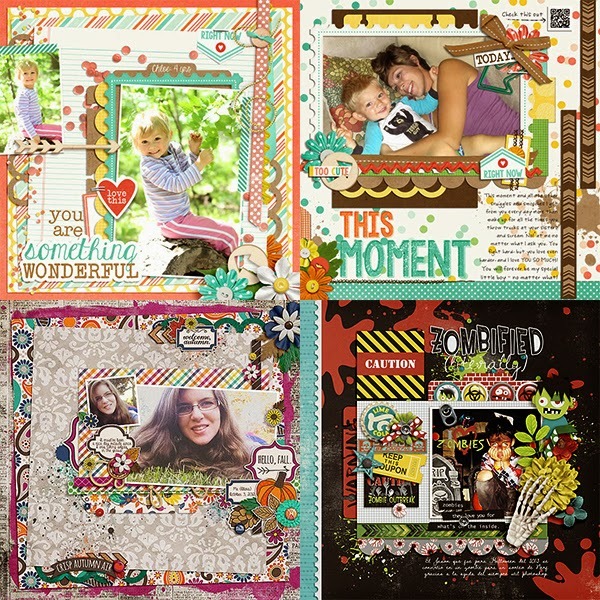 They are a handy tool to have in your stash to help create coordinated albums quickly. 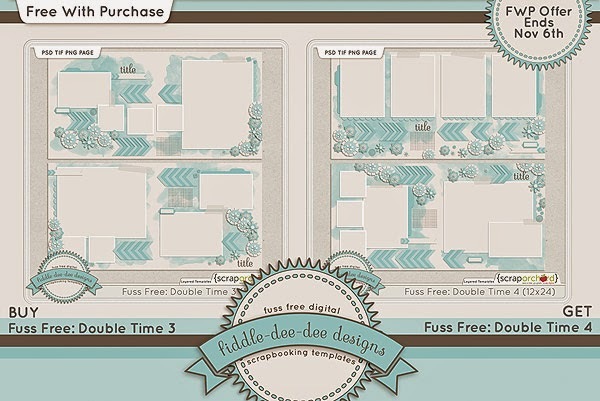 Yet because I'm still a single page scrapper at heart, I've also made Fuss Free: Double Time 3 and Fuss Free: Double Time 4 into 12x12 versions so that you can mix and match to create different combinations of double page templates, or you can just use them as single layouts as well! We all love hanging out at Scrap Orchard, and one of the best things is making signatures to identify us in the forum. I created Fuss Free: Signature Pieces 3 and Fuss Free: Signature Pieces 4 to make changing out your signature not only quick and easy, but beautiful as well. 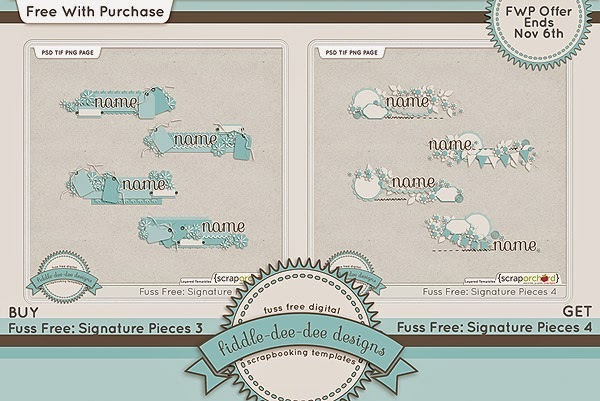 Grab a template and your favorite kit and within a short time, you'll have a beautiful "siggie." December is a busy time of the year, and it's very busy for my camera. I take so many pictures for December that it's sometimes hard for me to know where to start when I'm documenting this wonderful time of the year. 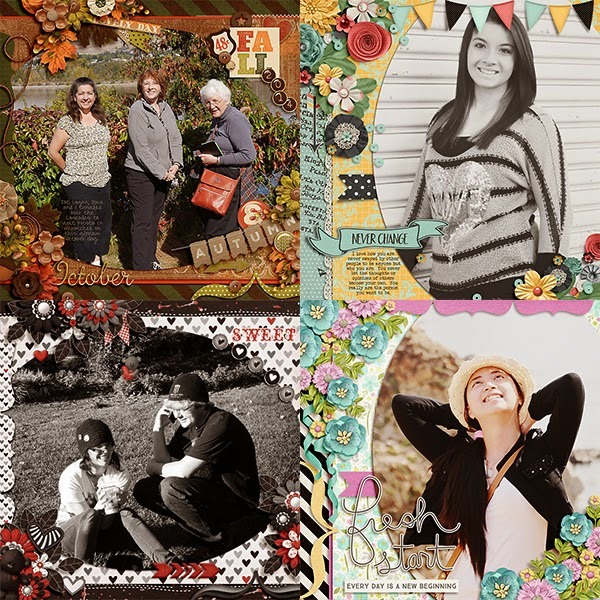 Fuss Free: Capture Your December 3 and Fuss Free: Capture Your December 4 will help you do just that ~ capture it, quickly and easily, and with no fuss! Large photos, multiple photo spots perfectly sized for your phone camera pictures, and a variety of elements make this set of templates one that you'll open up time and again to Capture Your December! We are oh-so-blessed in this life, not by great riches or pleasures, but in those quiet, small moments when we can share a word of encouragement, lend a hand, offer a hug, or do something to focus on someone else besides ourselves. 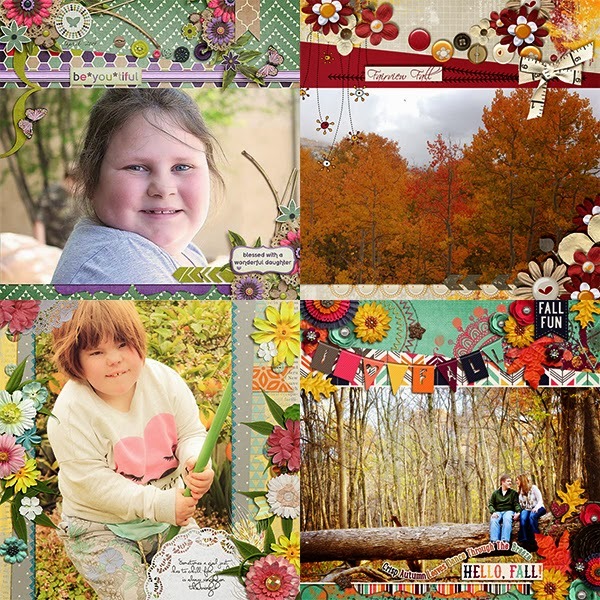 Fuss Free: Oh So Blessed 3 and Fuss Free: Oh So Blessed 4 are template sets designed to help you document those special moments of celebrating the sweetness in each moment in our lives, even if they aren't perfect! I have five (5) Free With Purchase offers this week. Our storewide sale is 35% off, and combined with my FWP offers, you can grab these templates at an excellent price! I'll be back later with another post about my regular template freebees for November, but for today, I'm sharing information regarding the free-with-purchase and freebee templates you can download for DSD! 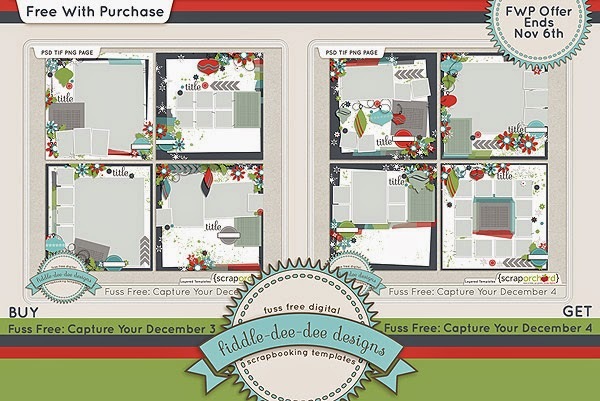 Fuss Free: Fresh Baked Templates 1 and 2 are available in the Fresh Baked Collaboration Kit and Add-On that you can receive for free when you make a qualifying purchase. 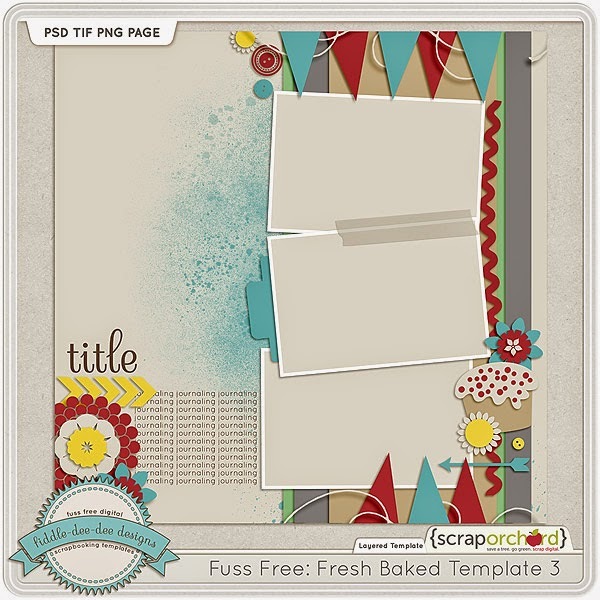 Fuss Free: Fresh Baked Template 3 will be available in one of our challenges on Saturday. Make sure you go by the DSD 2014 Game On Challenges Forum on Saturday to view the challenges and download this free template! 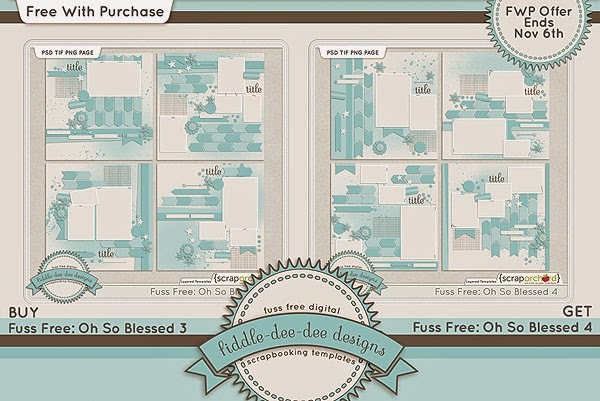 And Fuss Free: Fresh Baked Template 4 is available just by clicking on the image below! Happy DSD! Wishing you all the very best on this special holiday where we celebrate the very best of memory keeping! 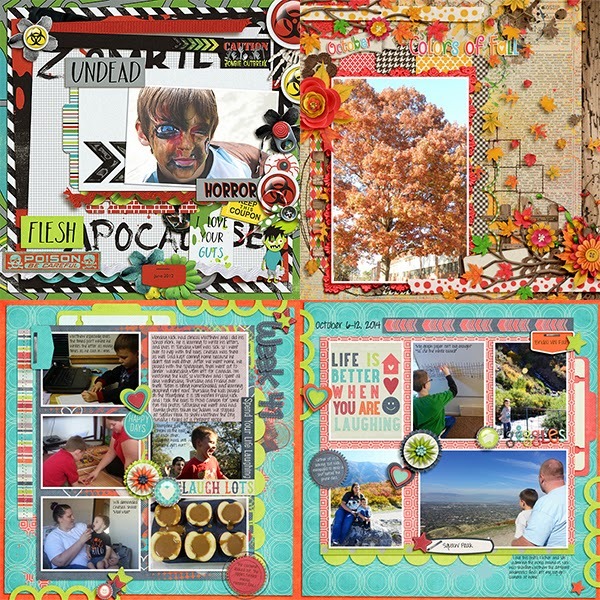 Happy Digital Scrapbooking Day! 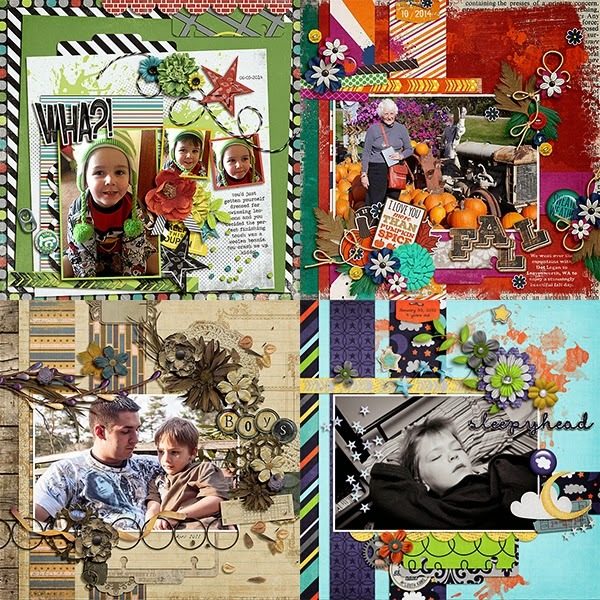 Your photo takes center stage in Fuss Free: Center of Attention 3 and Fuss Free: Center of Attention 4. 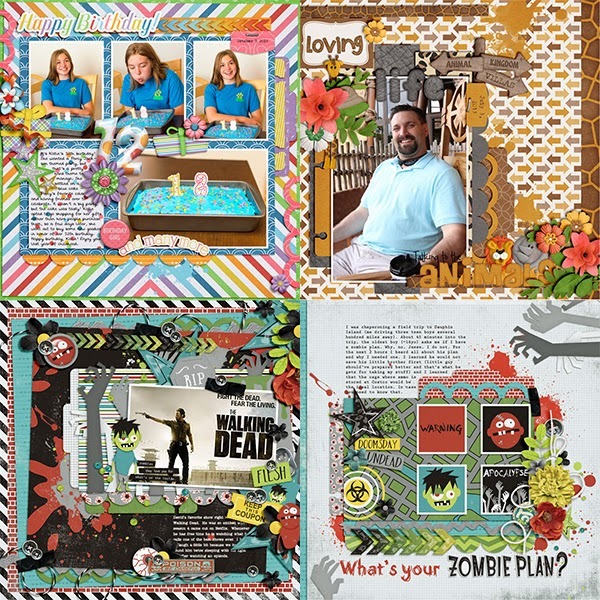 These large photo templates are combined with a generous layering of papers and elements to help you make show stopping layouts! 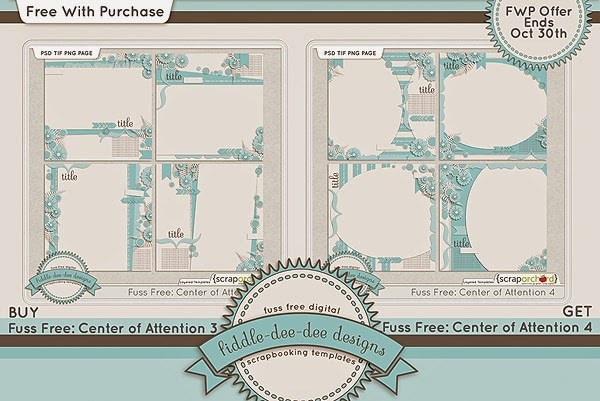 Purchase Fuss Free: Center of Attention 3 and receive Fuss Free: Center of Attention 4 for free! Offer valid through October 30, 2014. And there will be one extra freebee in the Scrap Orchard newsletter ~ there are five Fridays in the month so there will be one extra newsletter and one extra freebee ~ from me! I put a preview of the freebee under the FreeBee tab. Make sure you are subscribed so you don't miss it! 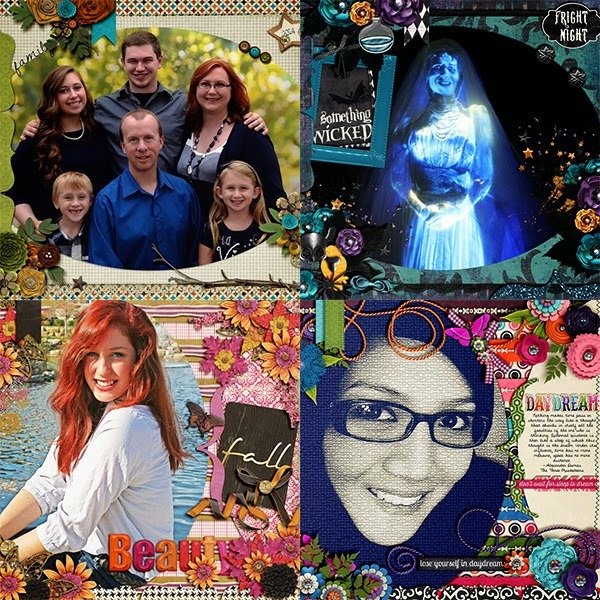 Prepare yourself for new freebees coming next month as well as Digital Scrapbooking Day on November 1st! In the meantime, keeping taking photos and scrapping! Fuss Free: Little Things and Fuss Free: Little Things 2 were created to help you record and document all those little, everyday moments that amount to big memories. The "mom-able" that you make for lunch every day. The drawings that cover every surface of your home. The sports clothes that string from one end of the house to the other. The snuggle time where wee ones wiggle and giggle. 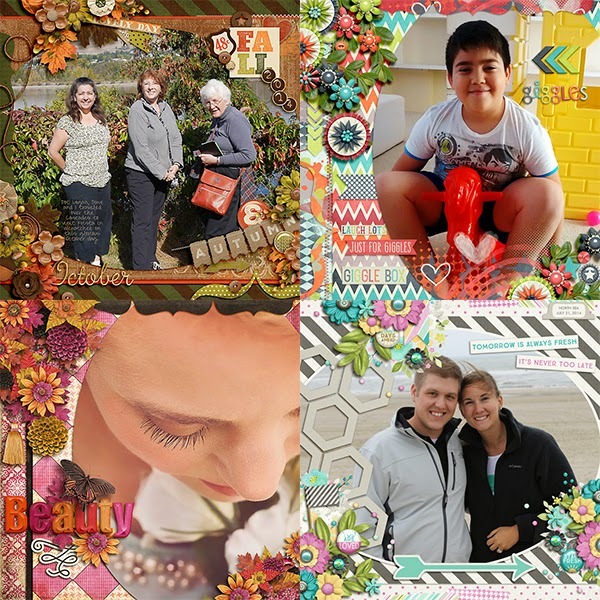 Each of these moments deserve to be captured and documented, and Fuss Free: Little Things 1 & 2 are the perfect template sets to help you do it! 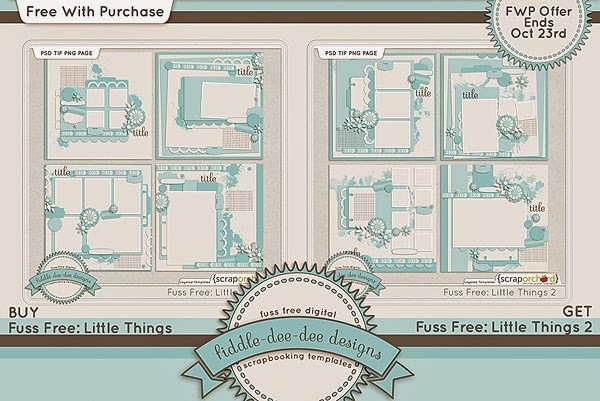 Purchase Fuss Free: Little Things and receive Fuss Free: Little Things 2 for free! Offer valid through October 23, 2014. I hope you enjoy all the little things in your life and take time to photograph and document them! Enjoy all your scrapping time!